Everyone seems to run the bubble, but Coach Brown has done a solid job in creating a thought process for how to attack an alley player in their read game. Having 4 different ways to account for the alley defender, they are able to put a defense in a bind and make them work on a lot of variations of what is really the same play. The key is to make it as simple as possible for the offensive players to execute through their teaching and terminology. Coach Brown shares the concepts and illustrates the variations with video. 32 game video cut-ups are included. It’s amazing to me to see all of the interest in the Pistol Offense, and the amount of creativity it has sprung at all levels of football. When I first started working at the University of Nevada in 2006 I had no idea that the seemingly simple alignment change that we made in our offense would take off the way it has. Being in the middle of that expansion has proven to be a tremendous tool in my development as a coach, but I’ve also started to realize that it has caused me to look at attacking a defense in a completely different way. Throughout my time in Reno, we had countless visitors from all levels of football, and one thing that Coach Ault was great about was getting ideas from those staffs in exchange for opening our doors. As a young Graduate Assistant I was able to clinic with some great offensive staffs from every level of football and from every corner of the country. One of the ideas that we started exploring and was of particular interest to me was the different zone read concepts we kept discussing with Spread staffs who were making the stop through campus. There was a lot of potential there, but we had to find out a way to incorporate it into the Pistol. One of the biggest misnomers I notice when people ask me about the Pistol Offense is that they tend to almost exclusively relate it to Zone Read schemes and a mobile quarterback. In reality, that element of the offense was really something that evolved with our personnel. One of the biggest advantages of the pistol set is that defenses have to defend both sides of the formations. We do not tip any of our plays by the alignment of our backfield. So to me the most interesting part of our expansion in the offense was figuring out how to incorporate Zone Read schemes into the Pistol Set to keep our philosophy. During the spring of 2007, we started playing with the mechanics and timing of how to run the Read concept from a Pistol backfield set. We played with a few different actions, alignments, and timing. Since everyone was doing this out of an off-set backfield we had no film to study, and had to work through it ourselves. 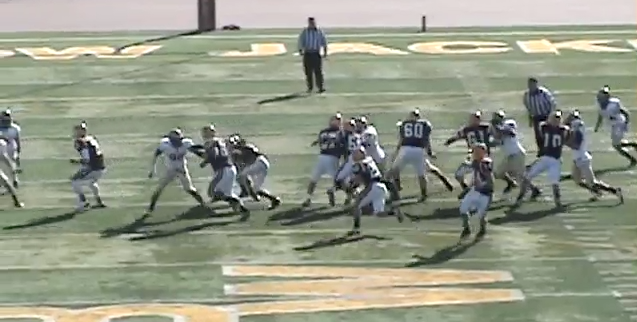 There was a lot of work put into adjusting our run-timing and the mesh between the QB and RB. Through this trial and error we realized that it would be possible, and now we just needed to commit to it. Once Colin Kaepernick took over as our QB it was very evident that we needed to utilize his physical tools to really stress the defense. That off-season the full commitment to the Pistol version of the zone read took off. Once we had this down, then we also needed to figure out the next step to expand again to stay ahead of the defensive adjustments. One of the first issues we needed to address once we dove into the zone read game was the perimeter blocking element of the play. We were a very efficient team when it came to running the inside zone, and because of this, teams committed a lot of their efforts to stopping the interior run game. A lot of times this simply forced the pull read and their answer was to run linebackers and safeties into a force position to account for the QB. The answer we needed to find was how to protect what we termed the alley. At the time there were three different answers we had to combat this problem. We could send our read side TE to the force player, or we could bring a WR or Wing from the opposite side of the formation to either block the defender or to use as a pitch man creating a triple option type look. These are still the answers that I utilize the most in our offense here at Fort Lewis. The first answer that we had was a simple force block by the TE. This really helped us in two ways. First, it took care of the SS that had been hurting us in the alley. The TE was able to become a perimeter lead blocker for the QB doing a block that he had already been doing on other plays. This also allowed us to read the closed side of the formation and hide our read side even more than the Pistol backfield set already did. Offensive Coordinator Dave Brown joined the Fort Lewis College coaching staff prior to spring practice in 2013 after spending the last seven years coaching at the Division I level, at the University of Nevada and Portland State. During his career, Brown has been on the coaching staffs of teams that appeared in seven bowl games. While at Nevada from 2006 to 2010, the Wolf Pack ranked at or near the top of the NCAA FBS leaders in rushing offense (first in 2009 and third in 2008) and total offense (second in 2009 and fifth in 2008). Brown coached Colin Kaepernick, who was the 2008 WAC Offensive Player of the Year and the only player in NCAA history to throw for 10,000 yards and rush for 4,000. In 2010, Brown left Nevada to join former colleague Nigel Burton and to assist in installing the pistol offense. At Portland State, he helped the Vikings lead the Big Sky Conference in rushing (203.3 yards per game) in 2010 and improve their total offensive output by 95.7 yards per game over the previous season. In 2011, Coach Brown returned to Nevada during the 2011 and 2012 seasons before joining the Skyhawks. Brown has 12 years of diverse experience in three different levels of NCAA football, with emphasis on every offensive skill position. Most notable is his experience with the pistol offense, which was actively involved in designing, teaching and adapting at both Nevada and at Portland State. When I installed the zone running game in 2004, Coach Bill Mountjoy wasn’t my original resource. However, I got to know him on Coach Huey and Jerry Campbell Football, and as I refined our use of the zone running game, I picked up many coaching points and strategies from Coach Mountjoy. It’s a privilege to share some of his knowledge in my post on American Football Monthly. Learn more about the zone running game in my two iBooks: 101+ Pro Style Pistol Offense Plays and The Zone Running Game: Create a Structured System. Both resources are filled with detailed information, interactive presentations, and game film. Since I incorporated the zone scheme into my offense in 2004, one of the common questions I get is, “Which side is the best to run inside or outside zone to?” It’s also been the topic of many friendly debates. In this two part series, we will look at the rationale behind running the zone in different ways, how it meshes with personnel, and what the objective is in doing it in each way. My new iBook The Zone Offense: Create a Structured System illustrates a method we used to teach the exact details of our offense. It was a drastic change from how I learned football. Technology provides us the opportunity to really teach the details of the game and create resources for our players to enhance their learning and performance. When we started using the system in 2004, we created a hyperlinked, power point playbook which included illustrated and animated position manuals. The feedback from the players was outstanding, “Coach this is like a video game.” That’s what we were looking for, and it made an impact on learning and performance as we rewrote the school record books and produced Ohio’s leading rusher and scorer. COACHING IS TEACHING – teaching is the ability to inspire learning. Our entire coaching and teaching philosophy starts with the teaching of good fundamentals. The first thing we will evaluate on film Saturday morning is the job we have done teaching fundamentals. What you see is what you taught or what you allowed in practice. The teaching of fundamentals is the first step towards the improvement of our players. Any coach can get up and diagram a play or defense. However, your truly great coaches are the ones who go out and teach fundamentals. We must teach our players how to play winning football. WE MUST GIVE THEM THE “LITTLE SECRETS” TO SUCCEED! Interactive position meetings to review techniques, mostly through still frame illustrations. Film sessions that were more than the coach telling what was right or wrong, but rather the players learning to verbalize what they were seeing while understanding the fix. Walk through periods before warm-up. Individual periods focused on working at little things (WALT). A high tempo and crisp practice focused on the details. All of these are illustrated in the iBook with plenty of examples. Our position manuals for each position are given a chapter each. Each is constructed around teaching the player the techniques that the will need to succeed in all of the different scenarios they will face in a game. This is a great resource for any coach, and of course it’s unlike anything else out there. 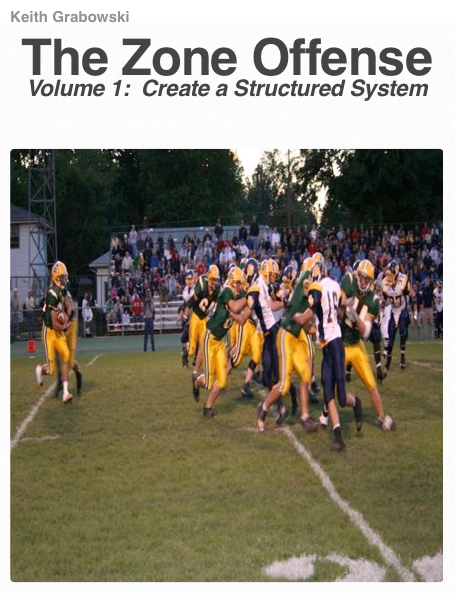 Get The Zone Offense: Create a Structured System on the iBookstore. 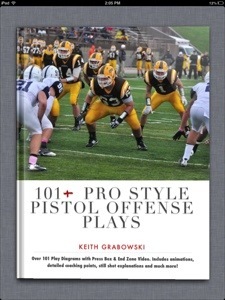 My first iBook 101+ Pro Style Pistol Offense Plays includes great content that reflects this coaching method as well. Last month, the focus was on Zone Read with a lead blocker. This month we will continue the focus on zone read, but see how it can be packaged with different reads and passing game components from quick screens to short routes that attack the void left by defenders committing to stop the run. There are a number of different techniques and rules on how to block inside zone or what some coaches refer to as tight zone. If you are already running zone, then do what you do. The purpose is to focus on how you make that run scheme more effective as the defense schemes different ways to stop it. 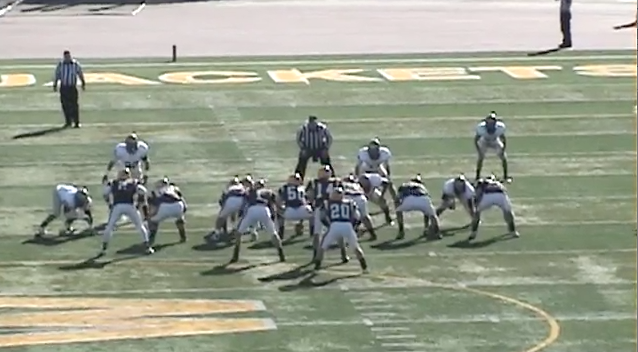 Read more on inside zone: FB Zone and Multiple Run Game with Zone Schemes. The most basic way to attack a defense is with the zone read-bubble from a trips formation. The defense is challenged by both how they will defend the zone run and the bubble. The play can attack on both perimeters (the bubble and the quarterback keep) as well as the middle of the defense with the inside zone. Read more. Learn more about our version of the pistol offense in 101+ Pro Style Pistol Offense Plays available for the iPad and Mac. It contains great ideas for any offense. The inside zone with bubble screen from trips has become a widely used play in football. More and more defenses scheme to stop this play. 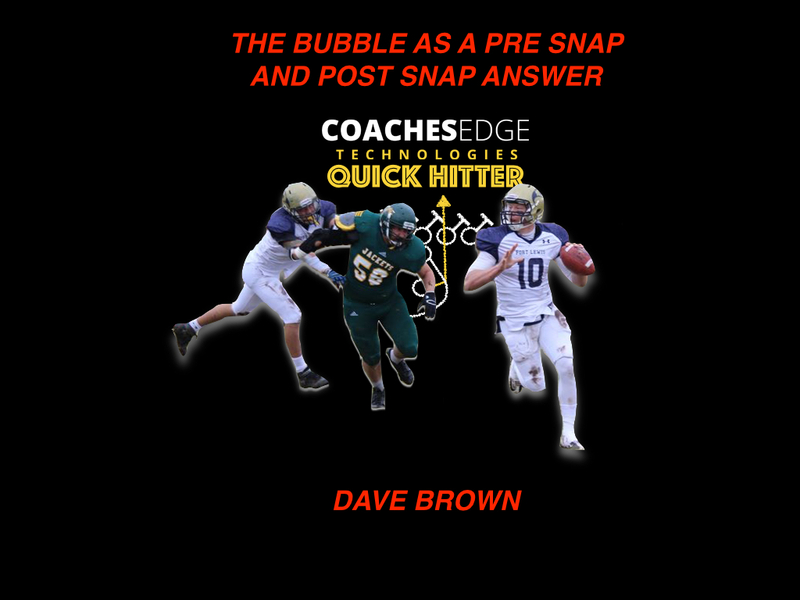 A popular way to take away bubble portion of the play is to align either head up to outside of the number two receiver in order to force the receiver catching the bubble back into pursuit and the cut down the field. In the example below, the defense has the bubble stopped schematically, the receiver does a great job making a move, breaking the tackle and getting himself into space for a decent gain. However, the #2 receiver was not able to get leverage, and the pursuit of the inside backer would have cut anything off to the inside. The defense can also take this away by playing man coverage or 3 defenders positioned over the three receivers. By alignment this discourages throwing the bubble. 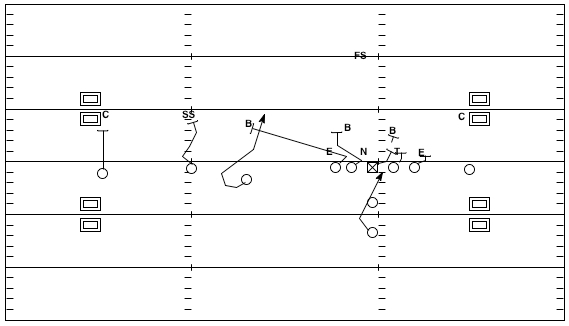 In the example, the quarterback gives the zone instead throwing the bubble. The gain is enough for the first down. The bubble could be thrown with some adjustments to the blocking scheme, but it’s definitely tougher than throwing it when the defense is aligned 2 over 3 with a safety aligned over ten yards deep. In order to slow this down or force the defense to use another tactic, a zone screen can be used to attack the space created by the widening alley player. Up front the play looks like zone initially. The tackle zone steps and slips up to the linebacker or safety over the #3 receiver, and the guard zone steps and slips up to the next linebacker. Both #2 and #3 take their initial steps as if it’s bubble. The initial move by both widens the defenders over them and sets up the blocks to create an alley inside of #2. In the example in the video, we are able to catch the defense in a fire zone and the tackle is now free to climb to the free safety. This is truly a constraint play to counter the defense’s efforts to stop the bubble. Throwing a simple screen in like this as a complement forces the defense to play the bubble more honestly or expose themselves to a big gain inside of the bubble. Read more about the inside zone scheme and the details to run it in 101+ Pro Style Pistol Offense Plays available for the Mac or iPad. The chapter on Zone includes diagrams, presentations, and game video on Zone as well as many other effective concepts for any offense, not just the pistol. It’s a football resource like no other. The inside zone lead is an effective way to attack the split side of the defense. Because the play typically hits down hill, linebackers who plug and cut sometimes cause a problem for the play. Though there may be some vertical push by the offensive line, the linebacker plugging and cutting in the hole presents some potential problems. When we faced a defense that used this technique, we felt it would be more effective to keep that linebacker on his feet and running and getting more of a horizontal displacement of the defensive line by using a wide zone (outside zone ) scheme and technique. In the following play, defense aligns their safety/outside backer in their 4-2-5 scheme to the field. We motion an H-back who is aligned at flanker across to the split end side. The free safety widens with the motion. On the snap of the ball the offensive line and h-back take their outside zone steps which has the effect of widening the defense as they react to not be reached. The linebacker who was able to plug down hill and attack the fullback low must now stay on his feet to defeat the block. 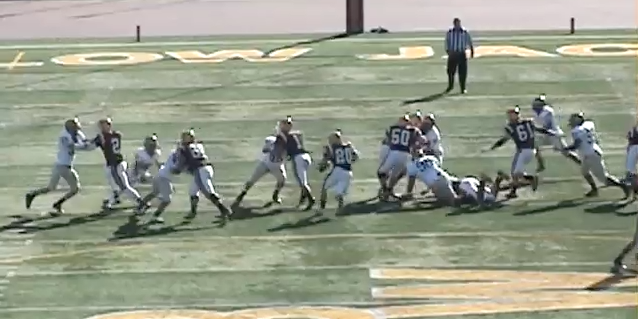 The fullback can now work to reach or displace the linebacker. The defense is stretched horizontally, and the fullback and tailback can now poke a hole in the front as the fullback sticks his foot in ground and cuts vertically upfield. More of the application of our outside zone scheme can is illustrated with diagrams and video in my iBook 101+ Pro Style Pistol Offense Plays, available for the iPad and Mac here.